These Instructions to Authors may also be downloaded as a PDF. Scientists from any country may submit manuscripts to Cell Structure and Function, irrespective of whether they are members of the Japan Society for Cell Biology. Submission to the journal implies that all authors have seen and approved of the manuscript, have agreed to its submission, and have the right to publish their work. Submission to the journal also implies that the manuscript is original work that has not been previously published in any language and is not under consideration elsewhere. Authors must inform the editors if any related publications are under consideration or in press elsewhere. Authors are encouraged to use the Author Checklist to ensure that their manuscripts are ready for submission to Cell Structure and Function. The checklist is for the authors’ information only; it should not be submitted to ScholarOne or the Editorial Office. All manuscripts must be submitted via the journal’s online submission system, ScholarOne: https://mc.manuscriptcentral.com/csf. The original or revised manuscript text may be uploaded as a PDF or MS Word file, but a Word file is required for the final manuscript text. Figures may be submitted separately in several other formats. Cell Structure and Function welcomes five manuscript types, all of which are subject to single-blind peer review. Full and comprehensive reports describing original research presented in the standard format of Abstract, Introduction, Methods, Results, Discussion and References. The main text (excluding references, tables, and figure legends) should not exceed 6000 words. Concise, topical reports describing original research that may not warrant a Full Article, but deserve publication as soon as possible. The main text should not exceed 2000 words and should follow the format for Full Articles. Articles presenting novel or unique overviews of recent or important developments in the field. Reviews must be insightful and must address the question(s) of interest using appropriate and fully presented evidence; exhaustive general summaries will not be published. Reviews are generally 5000-6000 words and can explore several aspects of importance in a broader subject area; Mini-reviews are shorter (2000 words) and address a single issue. Reviews and Mini-reviews are occasionally commissioned by the Editor-in-Chief, and the journal welcomes proposals from prospective authors. Concise articles that allow authors to report new or significant advances or developments in the techniques, technology or related aspects of cell biology. The journal also welcomes descriptions of methods that accompany new or newly developed techniques. Fully peer-reviewed, evidence-based articles that offer authors the opportunity to present novel viewpoints or opinions, or raise important matters, for the attention of the cell biology community. New data is not usually provided, but the journal will consider articles that use novel information to support their case. Perspectives should follow the same format as Full Articles, where relevant, and are generally 1000-2000 words in length. Manuscripts should be prepared in Microsoft Word using double line spacing throughout, with margins of at least 3 cm. Manuscripts should be written in clear, grammatically correct English. Authors whose native language is not English are strongly encouraged to have their manuscript checked by a native English speaker or by an editing service (such as INLEXIO) prior to submission. If a manuscript is not clear due to poor English, it may be rejected without undergoing peer review. A cover letter must be submitted, which provides a brief paragraph of an overview of the work, its significance and justification for publication. The journal also encourages authors to nominate one or more Associate Editors as potential handling editor(s) of their manuscript. Please see the list of Associate Editors. Each Full Article should comprise the following sections: Title, Authors, Affiliations, Key words, Running title, Footnotes including abbreviations, Abstract, Introduction, Materials and Methods, Results, Discussion, Acknowledgments, References, Tables, Figure Legends, and Figures (including photographs). In other article types, sections may be omitted or combined as appropriate. The first page of each manuscript should contain: Title, Authors’ full names, Affiliations, Key words, Running title, and the name and full address (including telephone number, facsimile number, and e-mail address) of the corresponding author. The title should describe the content of the article briefly but clearly. Do not use the same main title with numbered minor titles, even for a series of papers by the same authors. Do not use abbreviations in the title, except those used generally in related fields. The title should not exceed 100 characters, including spaces. Provide the full names of the author(s). Provide full names and addresses of institutions (including Laboratory, Department, Institute and/or University, city, state and country). When authors belong to different institutions, their respective addresses should be indicated by superscript numbers. When authors have new addresses, they should be given in a footnote and should be indicated by superscript symbols (such as * and **). A maximum of five key words should be provided. The running title should not exceed 50 characters, including spaces. Footnotes, if any, should be typed in a separate sheet (the second page of the manuscript). Abbreviations should also be listed on this page. Each abbreviation should be defined in parentheses together with its non-abbreviated term when it first appears in the text (except in the Title and Abstract). Common abbreviations that may be used without any explanation include ATP (NTP), ADP (NDP), AMP (NMP), cAMP, DNA, RNA, mRNA, tRNA, rRNA, DEAE, EDTA, and SDS. The Abstract should clearly express the basic content of the paper in a single paragraph and should include the problem addressed, experimental approach, main results and findings, and conclusions. Abstracts must not exceed 250 words for all article types except Short Communications, which should be limited to 200 words. Avoid using specific abbreviations. If it is essential to refer to a previous publication, omit the article title (e.g. Maekawa, S., Endo, S., and Sakai, H. (1989). Cell Struct. Funct., 14: 249–259). The Abstract should be typed in a separate sheet (the third page of the manuscript when Footnotes are used, or the second page when Footnotes are not used). The Introduction should provide sufficient background information to allow the reader to understand the purpose of the investigation and its relationship with other research in related fields, although it should not include an extensive review of the literature. The description of the methods should be brief, but it must include sufficient details to allow the experiments to be repeated. The sources of unusual chemicals, animals, microbial strains or equipment should be described, and the location (city, country) of the company should be provided in parentheses. If hazardous materials or dangerous procedures are used in the experiments and the precautions related to their handling are not widely recognized, it is recommended that the authors provide the necessary details. This section includes the results of the experiments. The Results and Discussion sections may be combined if this helps readers to understand and evaluate the study. Tables and figures, including photographs, can be used to present the experimental results (see below). Excessive explanations of the data presented in tables and figures should be avoided. The Discussion should be concise and should deal with the interpretation of the results. Novel models or hypotheses may be proposed in this section only if they are suggested by the results obtained in the experiments. Do not repeat the description of the experimental results in this section. This section should be brief. Authors should list all funding sources for their work in the Acknowledgments section. All the publications cited in the manuscript should be listed alphabetically according to the first author. When two or more publications by the same first author are cited in the text, they should be listed chronologically. References are cited in the text by surname and year within parentheses, e.g. (Tuma et al., 1999; Hurd and Saxton, 1998). An “in press” paper may be included in the references if the paper is expected to be published during the processing of the manuscript for publication in Cell Structure and Function. In this case, the authors are required to send three copies of the preprint to the Editorial Office to facilitate the review process. Research that has been “submitted for publication” or that is “in preparation” may be cited in the text by adding the appropriate phrase in parentheses, but such citations should be used sparingly. Personal communications must not be cited. Meeting abstracts must not be cited in the References; however, they may be cited in the text by indicating the publication abstract, page, and year. Oral presentations without published abstracts must not be cited. 1. Edelman, G.M. 1987. Neural Darwinism. Basic Books, Inc., New York. 371 pp. phosphorylation of cytoskeletal 350-kDa and 300-kDa proteins by insulin-like growth factor-I, platelet-derived growth factor and phorbol ester in rat 3Y1 cells. Cell Struct. Funct., 13: 417-423.
transcription of heat-shock operons and cell growth at high temperature. In: Heat Shock from Bacteria to Man (M.J. Schlesinger, M. Ashburner, and A. Tissieres, eds.). Cold Spring Harbor Laboratory, Cold Spring Harbor, New York, pp. 131-137. Number tables consecutively using Roman numerals (I, II, III, IV, etc.). A title should be given to each table and it must use capital letters. Explanatory material and footnotes should be typed below the table and should be designated with superscript letters, such as a) or b). Units of measurement should be included with numerical values at the top of columns. Avoid detailed explanations of the experimental conditions used to obtain the data shown in tables (which should be included in the Materials and Methods section). Figures include line drawings and photographs. Single-column figures must not exceed 84 mm x 220 mm. Double-column figures must not exceed 173 mm x 220 mm. Magnifications of photographs should be indicated in the legends and/or by scales included in the photographs. Illustrations must be self-explanatory and they should be numbered consecutively with Arabic numerals (i.e., Fig. 1, Fig. 2, etc.). Each figure should have a short title. Figure legends should be typed together in a separate sheet(s). Figure legends should include sufficient experimental details to make the figures intelligible; however, duplicating the descriptions provided in the Materials and Methods should be avoided. Supplementary material adds, but is not essential, to a reader’s understanding of a manuscript. Authors are encouraged to submit supplementary material for online-only publication. Supplementary material may comprise data, text, audio or movie files, and is published online alongside the accepted manuscript. As supplementary material is peer-reviewed, authors must submit it in its final form as part of their manuscript submission. After a manuscript has been accepted for publication, authors may not make any changes to the supplementary material. Authors are encouraged to consider the International Committee of Medical Journal Editors (ICMJE) Recommendations on ‘Defining the Role of Authors and Contributors’. The ICMJE recommends that authorship is based on four criteria: making a substantial contribution to the conception or design of the work, or the acquisition, analysis or interpretation of data for the work; drafting the manuscript or revising it critically for important intellectual content; approving the final version of the manuscript for publication; and agreeing to be held accountable for all aspects of the work. Any contributor who has met all four criteria should be an author on the manuscript. Contributors who do not meet all four criteria should not be authors of the manuscript but may be included in the Acknowledgments section instead. Submission to Cell Structure and Function implies that all authors have agreed to the author list. Any amendments to the list (such as changing the order, or adding or removing authors) after submission must be approved by all authors and the editor. In cases where experiments have been performed using humans or materials derived from humans, the authors must demonstrate that the work was carried out in accordance with the principles embodied in the Declaration of Helsinki and any guidelines approved by the authors’ institutions. For experiments conducted using animals or materials derived from animals, the authors must demonstrate that the work was performed according to guidelines approved by the authors’ institution(s). Submission to the journal implies that the manuscript represents original work. Cell Structure and Function uses CrossCheck™ software to screen manuscripts for unoriginal material. By submitting a manuscript to the journal, authors agree to this screening. The editors reserve the right to reject or retract the manuscript at any time if CrossCheck™ screening indicates that the manuscript contains an unacceptable level of unoriginal material. Authors may digitally manipulate or process images, as long as any adjustments are kept to a minimum, are applied to the entire image, and meet community standards. All figures in a submitted manuscript must accurately reflect the original data. To aid in their assessment of a submitted manuscript, the editors reserve the right to request original, unprocessed images from the authors. If a manuscript contains a figure that is not under the authors’ own copyright, the authors must show that the copyright holder has given permission for the figure to be used. In cases where previously published figures are included in a submitted manuscript, the authors must obtain permission from the copyright holders and the publisher of the original work. Reproducibility of published research is a fundamental tenet of the scientific method. Submission of a manuscript to Cell Structure and Function implies that the authors are willing and able to share material, data and experimental protocols with readers without unreasonable restriction. If this is not possible, the authors must explain why at the time of submission. Authors may make their own data and materials available as Supplementary Material, or in relevant public databases or digital repositories, by the date of publication. Authors must disclose the source of publicly available data and materials, such as public repositories or commercial manufacturers, by including accession numbers or company details as appropriate. In the interests of transparency, all authors must declare any conflicts of interest in relation to their submitted manuscript. A conflict of interest exists when there are actual, perceived or potential circumstances that could influence an author’s ability to conduct and report research impartially. Such circumstances could include (but are not limited to) competing commercial or financial interests, commercial affiliations, consulting roles, or ownership of stock or equity. Authors should list all funding sources for their work in the Acknowledgments section. Cell Structure and Function maintains the confidentiality of all manuscripts under consideration and all manuscripts that have been rejected. Submission to the journal implies that authors agree to keep all correspondence about their manuscript (from the Editorial Office, editors and referees) strictly confidential. As Cell Structure and Function uses single-blind peer review, the identities of referees are kept confidential. Journal staff will not disclose a referee’s identity unless the referee specifically requests such disclosure. As part of their responsibilities, referees agree to maintain the confidentiality of submitted manuscripts. The Editor-in-Chief allocates submitted manuscripts to an Associate Editor, who acts as the Monitoring Editor in charge of peer review. The Monitoring Editor selects two appropriate referees to provide their assessment of the manuscript. Referees are selected on the basis of their expertise, reputation and previous experience as peer reviewers. Once their reviews have been received, the Monitoring Editor determines whether the manuscript requires revision. Authors who are asked to revise their manuscript must do so within two months, otherwise it will be treated as a new submission. The Editor-in-Chief makes the final decision on each manuscript based on a recommendation from the Monitoring Editor. The other members of the Editorial Board act in advisory roles, providing feedback as reviewers and making suggestions to improve Cell Structure and Function. During the manuscript submission process in ScholarOne, authors may suggest preferred or non-preferred referees for the Monitoring Editor to include or exclude, respectively. The Editor may consider these requests but is under no obligation to grant them; the selection of appropriate referees is at the Editor’s sole discretion. The Monitoring Editor makes an editorial recommendation to the Editor-in-Chief, based on the referees’ comments and/or his or her own assessment of the manuscript. The Editor-in-Chief makes the final decision on each manuscript. If a manuscript satisfies the journal’s requirements and represents a significant contribution to the published literature, the Monitoring Editor may recommend acceptance for publication in Cell Structure and Function. If a manuscript does not meet the journal’s requirements for acceptance, but it has a high probability of acceptance after minor or major revision, the Monitoring Editor may ask the authors to revise it accordingly. Revised manuscripts must be submitted within 2 months, otherwise they will be treated as new submissions. If a manuscript does not meet the journal’s requirements for acceptance or revision, the Monitoring Editor may recommend rejection. Authors who believe that an editorial decision has been made in error may contact the Editorial Office to lodge an appeal. Authors must provide specific evidence of a misunderstanding or mistake by a referee or editor. Appeals will be considered carefully by the Editor-in-Chief, whose decision is final. Cell Structure and Function supports the correction of errors in the published literature. If published manuscripts are found to contain significant errors, the Editors will determine whether an Erratum or a Retraction is most appropriate. Errata describe errors that significantly affect the scientific integrity of a publication, the reputation of the authors, or the journal itself. Retractions are usually used for publications in which the results or conclusions are found to be invalid or unsound, or for cases in which authors are believed to have breached research or publication ethics. In cases where co-authors do not agree to a correction, the journal reserves the right to proceed with publication of an Erratum or Retraction that includes a list of the dissenting co-authors. Cell Structure and Function recently moved to a fully Open Access publication model. For more information on the journal’s Open Access policies, see the Open Access Frequently Asked Questions (FAQs). There are many costs associated with publishing scholarly journals, such as those of managing peer review, copy editing, typesetting and online hosting. To cover these costs in the absence of journal subscriptions, authors (or their representatives) are asked to pay article processing charges (APCs). 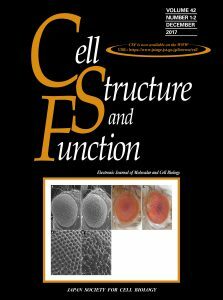 The APC in Cell Structure and Function is ¥100,000 for all article types except commissioned Reviews and Mini-reviews, which are free to publish. Authors of accepted manuscripts will be invoiced for the APC before publication of their manuscript. The journal does not charge a submission fee. Authors are required to sign a License to Publish to grant the Japan Society for Cell Biology permission to reproduce the work in Cell Structure and Function under a Creative Commons license (see below). Open Access publications in Cell Structure and Function are published under the Creative Commons Attribution (CC BY) 4.0 International license. For more information about this license, see the Open Access FAQs page. Copyright of articles printed in Cell Structure and Function belongs to the Japan Society for Cell Biology for published articles submitted before 1 October 2016 and to the Authors for published articles submitted on or after 1 October 2016. More information about the journal’s Open Access policy is available on the Open Access FAQs page.